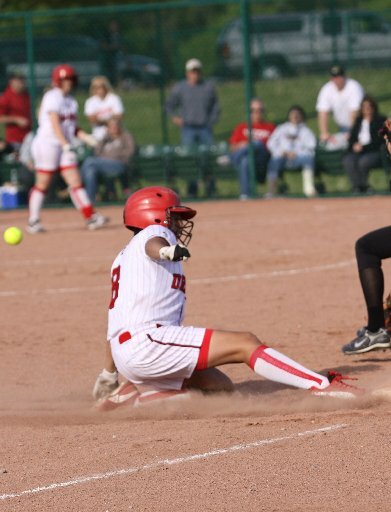 Nic McNenly | For The Flint Journal, May 17, 2010 4:08 p.m.
Every time the Swartz Creek softball team takes the field, it has a single visual reminder of why it plays the game. On the fence in left-center field, the 2009 district championship banner hangs, helping each returning player remember how important the smallest steps can be. "It's the only banner there, but not for long," said junior Erin Hescott. "Last year, we had a good defensive team but we struggled with hitting. This year, we have the hitting and the defense, but we also have a lot of heart." The Dragons have come alive this season at the plate. They averaged 11 runs per game in the first half of the season. As of May 6, the Dragons held a 6-2 Metro League record and 15 total wins, just two shy of last year's 17-21 record. As a team, Swartz Creek is batting .373, which is way ahead of where it finished last year (.250), and light years ahead of the .190 average in 2008. Other things are up too, like on-base percentage and fielding average. "The program has advanced, no question about it," said coach Rick Clolinger. "The kids are playing well and they are battling." Another big part of Swartz Creek's success has come because they have been able to clear off bases when runners are in scoring position. That was a big problem in years past and is something that Clolinger has talked about over and over again. Sophomore Michaela Krusina leads the team with five home runs, while Chris Burt has three. Hayley Cruthers has two dingers and Nicole VanCamp hit her first homer of her high school career in April. "We aren't really doing anything different than we did in the past," said junior Meagan Photiou. "We're just focusing and getting hits and we've been able to get our bat on the ball." Something that the Dragons were concerned with at the beginning of the season and something that continues to haunt them is pitching. With a few solid hurlers, the Swartz Creek squad sometimes has trouble closing out an inning or a game. Those letdowns have frustrated the players, as well as Clolinger. What makes things worse is that the Dragons have begun the toughest stretch of their schedule. "At times, our pitching is mediocre and we end up behind," he said. "We don't like playing from behind because then we're forced to score and that adds the pressure. We've got some tough games coming and we're going to have to work hard to compete. Good teams will take advantage of those weaknesses and that can hurt us." "It's frustrating not to beat a team when you're supposed to," Hescott said. "It's in the books, though, and there's nothing we can do about it once it's over. If we hang our heads, other teams will stomp on us. We need to pick up our teammates and move forward. You have to look ahead to the next hit, the next pitch and the next out." Cruthers has been a pleasant addition to the Dragons on the mound and at the plate. She has the best record of the Swartz Creek hurlers. At the plate, she leads the team in every category and has an impressive .650 on-base percentage. "Sometimes I have to remind myself that she's just a freshman," Clolinger said. "I put her in a lot of situations and she comes through most of the time but it's easy to forget that she's just a 14-year-old player." When Cruthers' pitch-count gets high, Nicole Terry and Photiou are called upon to sit down batters. Tri-captains Stephanie Rett, Burt and VanCamp are doing their part to keep the team motivated and to keep everyone's role clear. "Sydney Saidoo is our right fielder and is hitting over .400," Clolinger said. "I've told the girls that if they want that spot, they have to beat her out. It has to be incentive because we're here. When we lose, I want it to start a fire in their belly. I want it to eat them up the way it does me. I'm dedicated because I want to win the Metro and I want to win a state championship. We're here, and we're going to make some noise before it's over." Clolinger isn't the only one who wants more than one reminder hanging in the outfield. "We're getting the Swartz Creek name out there for the first time," Hescott said. "We want more banners on the fence."